Highlight message or folder and click, on Delete. From FirstClass menu bar, click on the File, then click on Delete. Click on your First message or Folder in list then hold the shift key and use the arrow key to move down the list, release shift key on last message or folder that needs to be highlighted. Click Delete once everything needing to be deleted is highlighted. Found on the UNA desktop. Any deleted items stay in trash can for 14 days and are then removed automatically by the server. Deleted items can be retrieved from Trash Can if they were deleted within the 14 days. If they have been there longer than 14 days, contact IT. 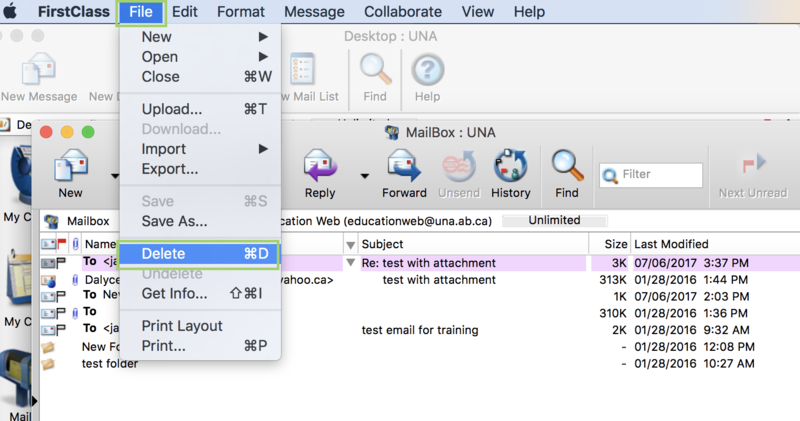 Double click on Trash Can to open and highlight message(s) or folder(s) then, click on Undelete.